Magnesium helps improve your health, sleep, and exercise performance. Here's how to supplement with it, and which side effects to watch out for! You already know how important it is to have a balance of essential minerals like calcium, sodium, and potassium in your body. Another important mineral you might not be as familiar with is magnesium. Getting enough vitamins and minerals—including magnesium—is important for a wide variety of functions in the body, including bone mineralization, enzyme reactions, and nerve stimulation. Unfortunately, many of us have magnesium levels that are too low. Forty-eight percent of people in the United States don't take in enough dietary magnesium, even though many food companies fortify their processed foods with this mineral. Magnesium deficiency has been linked to constipation, insomnia, headaches, and lower bone-mineral density. The long-term effects of some of these issues can lead to serious illness. Thus, it's important to know how this mineral works and what you can do to keep your body healthy. Everybody poops, right? Well, some do more than others, and now and then you need a little help. Getting backed up is one of many signs of magnesium deficiency. Supplementing with magnesium can help you poop. You know sleep is important for your health, but did you know that your vitamin and mineral intake can affect how long and how well you sleep? Take magnesium, for example. It binds to a special neurotransmitter called GABA. As it turns out, a dietary deficiency of magnesium may cause a lack of quality sleep, trouble falling asleep, or both. And better sleep means better recovery, which means better muscle growth. Studies also show that not getting enough magnesium may lead to behavioral and psychological changes such as anxiety, aggression, and stress, all of which can also be bad for your sleep. Clinical trials have suggested that magnesium can help you sleep better, but it will take more research with different types of people to prove this for certain. Calcium and magnesium both play an important role in controlling muscle activity. Magnesium helps with relaxation, while calcium helps with contraction. Unbalanced calcium and magnesium levels could lead to muscle cramps or spasms. Potassium and sodium also play a role in muscle contraction, which is why heavy lifters and athletes need to be aware of electrolytes—like potassium and sodium—when they work out. Not getting enough potassium or sodium in your diet can affect your athletic performance. Adding more magnesium is important for your potassium levels. Potassium cannot cross the cell membrane by itself—it must have magnesium present to enter your cells. Without magnesium, your body cannot absorb and use potassium. Low levels of magnesium may put you at risk for potassium deficiency, which can lead to weakness, cramps, and fatigue. Increasing magnesium in your diet, through food or supplements, can prevent electrolyte imbalances and improve your performance in the gym. Calcium is an essential mineral for building strong bones, and you already may be taking a calcium supplement or eating calcium-rich foods as often as possible. In truth, many other vitamins and minerals besides calcium are also responsible for strengthening bones. Vitamin D is another key bone-building nutrient, and so is magnesium. Magnesium and vitamin D may increase calcium uptake and delivery, which is needed to build strong bones and teeth. This is why magnesium and vitamin D are so important for bone health: If your body can't use the calcium, it can't build strong bones! Initial trials in fracture-prone patients with low bone-mineral density showed that magnesium supplementation may improve bone health with no negative side effects. These trials were done with a very specific population, though, and similar trials with additional populations are needed. Magnesium supplement recommendations range from 310-420 milligrams per day for adult men and women. Some studies have used up to 500 milligrams per day in elderly people with magnesium deficiency. Uptake and metabolism of magnesium is different for everybody, which is why proper dosage varies by person. If you have lower levels of magnesium or severe deficiency, you might need to take more. Start with a 200-milligram dose, and slowly increase it to see how your body reacts. Magnesium is safe and effective when taken properly. However, it may interact with certain medications such as antibiotics, muscle relaxers, blood pressure medications, and bisphosphonates. Always check with your doctor before starting a new supplement plan, even if you don't have any known medical conditions. There are no dangerous side effects. Uncomfortable but mild side effects can include gastrointestinal pain, stomach cramping, and diarrhea. If any of these happen, try taking a lower dose. 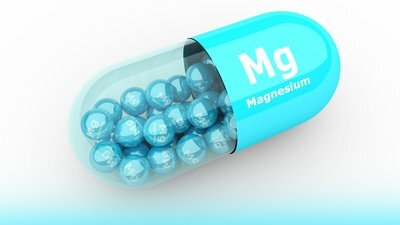 What forms of magnesium are available? Magnesium has many forms. It can be taken orally or even absorbed topically through the skin. Epsom salts, for example, contain magnesium sulfate and can be absorbed through the skin when dissolved in a bath. A 20-minute soak in an Epsom salt bath can reduce muscle soreness and help you relax. Chelated magnesium is a highly bioavailable oral form of magnesium and is very similar to the magnesium found in foods. It's best for raising magnesium levels in the blood to fix overall deficiency. Magnesium supplements are available in pill or powder form and can be purchased online or at many drug stores. When should you take magnesium? To avoid feeling tired or sluggish, it may be best to take your magnesium supplement at night, but taking it during the day also works fine for most people. You can naturally increase blood levels of magnesium by eating foods that have a lot of it. Dietary sources of magnesium are better used by the body than supplements. Food sources of magnesium include leafy green veggies like kale and spinach, black beans, and nuts and seeds like pumpkin seeds and almonds. Add a leafy green salad to your lunch, add beans to your favorite side dish, or just munch on seeds and almonds for a snack. Eating a lot of different magnesium-rich foods will help raise your magnesium levels over time, putting you on the path to better overall health and well-being. Magnesium supplements are safe and effective for most people. They're a good idea if you don't get enough of magnesium from food. Taking a magnesium supplement may help you sleep better, get the most gains in the gym, keep your bones strong, and help you stay regular. Rosanoff, A., Weaver, C. M., & Rude, R. K. (2012). Suboptimal magnesium status in the United States: are the health consequences underestimated?. Nutrition Reviews, 70(3), 153-164. Dupont, C., Campagne, A., & Constant, F. (2014). Efficacy and safety of a magnesium sulfate–rich natural mineral water for patients with functional constipation. Clinical Gastroenterology and Hepatology, 12(8), 1280-1287. D'Angelo, E. K., Singer, H. A., & Rembold, C. M. (1992). Magnesium relaxes arterial smooth muscle by decreasing intracellular Ca2+ without changing intracellular Mg2+. The Journal of Clinical Investigation, 89(6), 1988-1994. Sojka, J. E. (1995). Magnesium supplementation and osteoporosis. Nutrition Reviews, 53(3), 71-74.